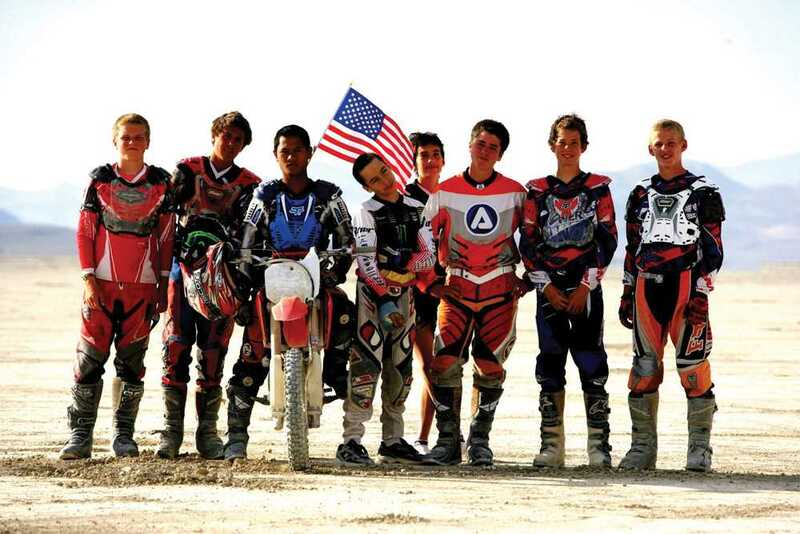 LINEUP: Tam students including Kroeksak Onchan (on bike), Max Schank (to Onchan's left), Mike Krakauer (third from right), and Orie Johnson-Young (second from right), travel with friends to the Nevada desert to ride. Motorsports are not typically associated with high school. However, some Tam students are devoted fans of the sport of dirt biking, including sophomore Kroeksak Onchan, who has been riding for a year. “[I started riding] through my friends,” he said, “There’s a guy named Dave who [runs youth dirt biking trips], and I just started tagging along, and I got really into [it],” said Onchan. Dirt bikes are motorcycles equipped with off-road tires, higher ground clearance, and off-road suspensions, among other modifications. Senior Nick Urban also rides. “It started in fifth grade,” he said. “My dad figured that since he learned young, and since I grew up liking adventurous kinds of things, that it would be good for me to start at a young age.” Urban’s entire family has helped to foster his passion for riding. “My sister rides, my mom used to ride, and pretty much all of my uncles ride,” he said. Urban rides primarily in Marin, but also travels to other locales to experience varied terrain. As with all motorsports, safety is a concern. Motorcycle crashes can be particularly dangerous because the riders have no airbags, no seatbelts, and no substantial area of the vehicle to help absorb energy in the event of a collision. Urban is well aware of the dangers. “My mom’s really against street riding because my dad’s brother died in a motorcycle accident. He got hit by a drunk driver,” he said. To help protect themselves, riders must wear full-face helmets, and most also choose to wear body armor. Despite the dangers, passionate riders find the rewards to be worth the risk. “My parents are a bit scared, because a lot of my friends have broken bones [while riding], but it’s really fun, and it’s worth it,” Onchan said. Onchan continues riding because he loves the thrill of speed. “I just like to go fast, out in the desert, on the dunes, and do some tricks,” he said.